I don’t like naming a recipe after a season because no one but you knows what that really means. However any other title that I came up with was just too dang long and I don’t like that even more. 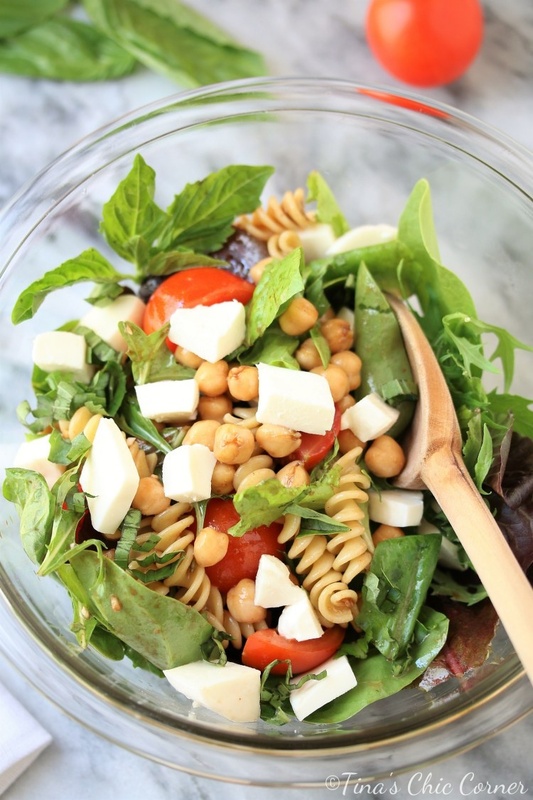 This is a Caprese salad with lettuce, chickpeas, and pasta with a balsamic vinaigrette dressing. See what I mean? It’s a mouthful. Now that tomatoes and basil are in season around here I’ve deemed this a Spring salad. You can call it what you like, but at the end of the day it’s a bowl full of deliciousness and that’s all that really matters. Now that I’m armed with tomatoes and basil, I’m eating as much of it as I can. I made a tomato, basil, and mozzarella wrap a couple of times for lunch this week. I made a margherita naan pizza for dinner over the weekend. Now I’m using the fab trio in this salad. This is not just any ordinary salad though. You know, an all veggie fest that leaves you hungry an hour later. I added chickpeas for some good old fashioned protein and pasta to make it more hearty. 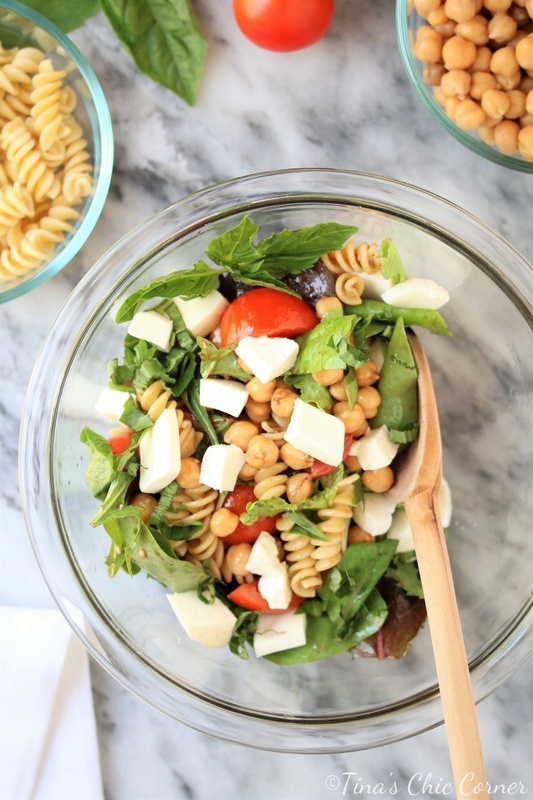 I only added a little bit of pasta and boy does that really kick this salad up a notch. I went with a balsamic vinaigrette dressing, which is out of this world delicious. I find that balsamic vinegar can be a very strong flavor so I added a small amount of mustard and honey to help tone that down. This is my new favorite dressing now. Cook the pasta according to the directions on the box, then strain it and set it aside. 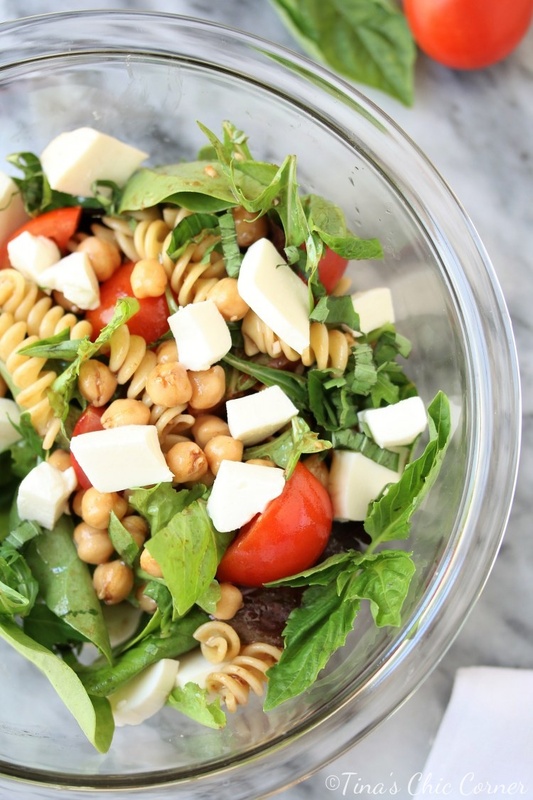 In a medium bowl, add the lettuce, tomatoes, sliced basil, chopped mozzarella cheese, chickpeas, and cooked pasta. Pour in the dressing and stir everything together. Divide among 2 plates and enjoy! In a small bowl, whisk together the balsamic vinegar, honey, mustard, oil, and minced garlic. This salad looks so delicious. Perfect for this time of year. Thank you! It’s a great “linner” when you don’t want to cook dinner on a hot day.